‘OPTIMUM LIVING MADE EASY’ the quasi-ironic legend just about declaims, from the second of five large-scale paintings that make up a new cycle of work by Victoria Morton. Or at least that's what it appears to say, as the poster-size message which resembles a stencilled-in slogan is all but obscured by swirls of red camouflage as well as the image of a female figure who appears to be squirting paint into her palm. 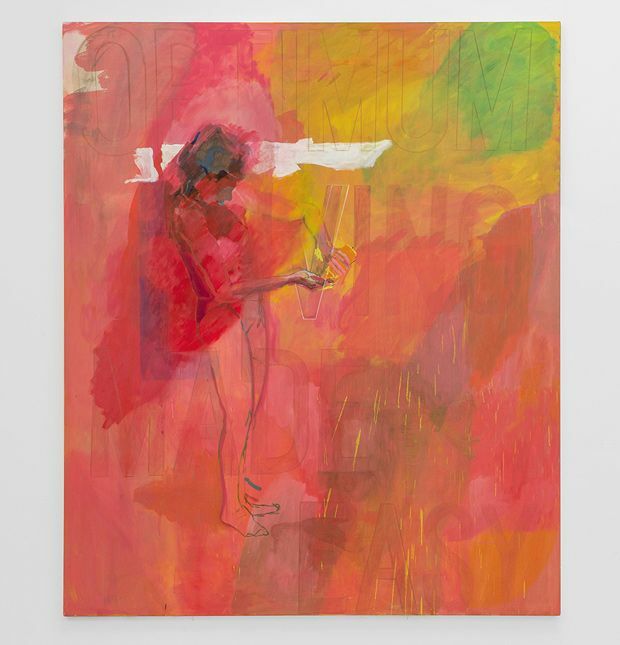 Such wilful discretion is the most tellingly talismanic image on show, even as it acts as a bridge between the explosions of colour elsewhere. At times improvised but never slapdash, these burst forth with a self-referential life-force which flits between a blood-rush of fevered activity offset by pools of calm that trickle out beyond the oranges and lemons. As a very personal story board, it highlights a vivid life and death swirl that points to little moments captured from everyday narratives. These aren't so much made flesh as have their psychological innards put under the microscope in a way that goes beyond words, in a shadow line that borders the woozy limbo-land between process and product.